SiteGround vs Bluehost – Which Web Host is Better? You are here: Home / Blogs & Websites / SiteGround vs Bluehost – Which Web Host is Better? Looking for web hosting and can’t decide between SiteGround and Bluehost? In this article, I’ll help you decide which web host is better by comparing the main features of these two popular web hosting sites. By the end, you’ll have a better understanding of these two hosts and you’ll be able to choose the best host for your website. Although both web hosts are handpicked by WordPress.org as two of the best web hosts to host a WordPress website, you’ll soon learn that one of these is much better than the other. I’ve hosted with Bluehost in the past and over the last 2 years, I’ve been researching web hosting to see who currently has the best web hosting so I could advise my readers. Most people get web hosting for their online business so you’ll need to make sure that the web host you have is able to display your website 24/7 and be able to give timely and effective support when needed. To give you a run down of what to look for when evaluating a web host, see the following list. Fast web hosting (under 1 second is ideal). 24/7 reliable support via live chat and other channels. There are other things like bandwidth and technical specs but these things aren’t as important as the ones I’ve listed above since nearly all hosts will give you just about the same features when you’re looking for shared hosting. Also, you do not need anything other than shared hosting unless your website is already massive and getting huge amounts of traffic (over 100K/month). Bluehost is the more popular of the two and has a large customer base. The site is owned by the Endurance International Group, a conglomerate that owns a lot of web hosting companies online. I’ve hosted with Bluehost in the past before and after they were acquired by EIG. My experience with them was plagued with lots of down time but I didn’t move my websites until a bad customer service experience that ended in me unknowingly deleting all of my website comments so that my website could be put back online. 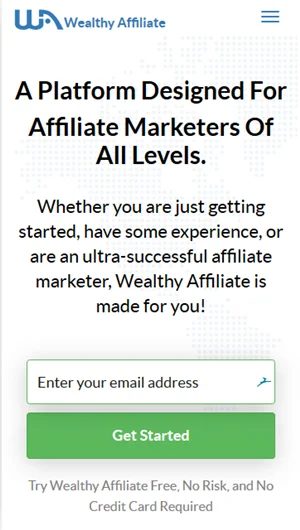 I ended up moving my websites to Wealthy Affiliate’s web hosting because I was already paying for their premium services which included WordPress hosting. SiteGround is less popular than Bluehost but it has a huge loyal following because they take care in all aspects of their service. They are independently owned and very reputable. If I hadn’t moved my websites to Wealthy Affiliate, I would have moved them to SiteGround. I think you can see where this is going but I’ll compare the two below. Here are some reasons why SiteGround is the better web host than Bluehost. Any web hosting company that is part of the Endurance International Group should not be considered if you’re looking for web hosting. None of these web hosts offer a good service and once they’ve been acquired by EIG, their reputation is going to go downhill. This is because EIG for some reason, buys web hosting companies and stops investing in them the way they should. They outsource and cut back on support staff so the support becomes terrible. They pack as many customers as they can on servers so the service becomes slow. If the host used to be great, they just become worse. This is the unfortunate case with Bluehost and also Hostgator which was a great host before they were acquired but is now one of the worst hosts you can go with. SiteGround isn’t owned by EIG and has a great reputation because they offer a great service overall. There are tonnes of great unbiased reviews and recommendation around the web that praise SiteGround’s web hosting and SiteGround regularly beats out Bluehost whenever they are both mentioned. I’ve searched and searched some more on Bluehost’s website for their uptime guarantee and couldn’t find anything. Not even a bullet in their feature list that says 99% uptime. This is a big red-flag to me and it says that Bluehost cannot guarantee their uptime. From my experience, Bluehost customers experience regular downtime for long periods and this is not only frustrating but it can hurt your business. You absolutely need to have at least a 99.9% guarantee if you’re looking for hosting. Bluehost has been apologizing to customers on a regular basis for downtime and you can see this in the Twitter updates below. We encountered a bug during scheduled maintenance causing extended downtime for some of our Cloud Sites customers. Our sincere apologies. Hey everyone, our servers are currently down. We’re working hard on restoring services. Tech support may be slow until things are resolved. Hey Joe, our systems are going through unplanned downtime. We’re working on resolving this ASAP. We apologize for the mess. And customers keep complaining about the downtime issue. Stay away from BH bad service – downtime is often – on a shared plan oh that is a no no go. @bluehost service for all domains down. It’s getting worsened ! Why? #bluehost ,,, downtime nightmare. SiteGround on the other hand proudly displays their 99.99% uptime guarantee on their website as part of their web hosting features. SiteGround is able to achieve this by using the latest technology which they’ve developed themselves. For example, they have proactive server monitoring created by the SiteGround DevOps team which checks the server status more often than other standard monitoring systems can. Any issues that are detected is fixed immediately but the best part is that this monitoring system can foresee upcoming problems and take action to prevent them. The fact is that Bluehost has regular downtime issues that frustrate their customers and SiteGround has technology that makes downtime a non-issue. If you want your website to perform well on search engines like Google, your websites need to load quickly usually in under a second. Having a web host who serves up your website at blazing speeds can benefit you greatly. New SiteGround customers immediately notice a boost in speed whenever they transfer their websites from another host. SiteGround uses their own caching technology to serve up websites at lightning speeds. In a test versus 12 other web hosts including Bluehost, only one host beat SiteGround on general loading speed without cache but SiteGround beat them all when the cache was turned on. Since Bluehost was one of the web hosts here, it is evident that SiteGround beats Bluehost on speed. The faster your website loads, the better it will perform not only in search engines but for your visitors. 4. Who Has the Better Customer Support? With Bluehost, you’re dealing with an EIG-owned web host and this is a bad thing when it comes to customer support. My experience with Bluehost customer support caused me to immediately move my websites. Also, when I contacted support while hosting with Bluehost, it would take roughly 10 minutes and sometimes more to get through on the live chat. This experience was enough for me to conclude that Bluehost is terrible at customer support. Probably not the worst though, I think Hostgator’s support gets that award. SiteGround’s customer support is the complete opposite. SiteGround’s support is fast to respond – among the fastest in the industry. They offer multiple channels including 24/7 live chat, phone and ticket support. They pride themselves in getting you fast support by answering a ticket in 10 minutes or less while other hosts take up to 24 hours to respond. Phone support is picked up immediately and live chat is answered immediately as well. You do not have to wait at all to get your issue dealt with when you contact SiteGround. In addition to these channels they also have a knowledgebase, tutorials, webinars and new customers are greeted with a setup wizard that provides guidance. Take a look at what people are saying about SiteGround’s customer support on Twitter. Honestly @SiteGround customer service is the bees knees because they were able to make my site work in like 20 minutes once the ticket was finally submitted successfully. Now to spend the next little while getting everything updated on my site. I’ve been on live chat support with @SiteGround for maybe 3 minutes for a friend’s website, and all i can say is I will be immediately switching all my sites from @bluehost simply because of SiteGround’s A+ customer service. Not to mention the load speed is easily 3X faster. To be fair, from my research, even Godaddy has better customer service than Bluehost. 5. How Do They Secure Your Website? Both web hosts offer free SSL certificates which is now a requirement nowadays if you have a WordPress website so I’m not going to talk about that. SSL certificates should now be free when you’re choosing a web host otherwise choose a different web host. What I’m going to compare both hosts about in terms of security is how secure your website is from hacking, intrusion and malware. Once again SiteGround wins because of their technology and approach to securing your website. Their unique anti-bot AI is able to block up to 2 million brute force attacks per hour across all servers before they even reach their customers websites. Then their is their account isolation which prevents your website being affected by malware on a shared server. SiteGround was the first web host to introduce this type of account isolation back in 1998 and many web hosts still don’t have this type of protection available on their servers. In a test of 12 leading web hosts which included Bluehost, it was found that none of the web host patched vulnerabilities even a month after they were publicly announced. SiteGround had the vulnerabilities patched 48 hours after the announcement. Bluehost is still way behind SiteGround in terms of security and if you want to run your WordPress website without fear of it being hacked, then SiteGround is the better web host for you. load times – SiteGround has some of the fastest speeds in the industry. customer support – EIG wrecked Bluehost’s customer support while everyone praises SiteGround’s fast support. It is no secret that I am not a fan of Bluehost but the comparisons prove that they aren’t as a web host as SiteGround. Check out my full SiteGround review to see why they’re the best WordPress web host if you’re looking to host your affiliate websites. And if you’re already convinced, you can get SiteGround here.